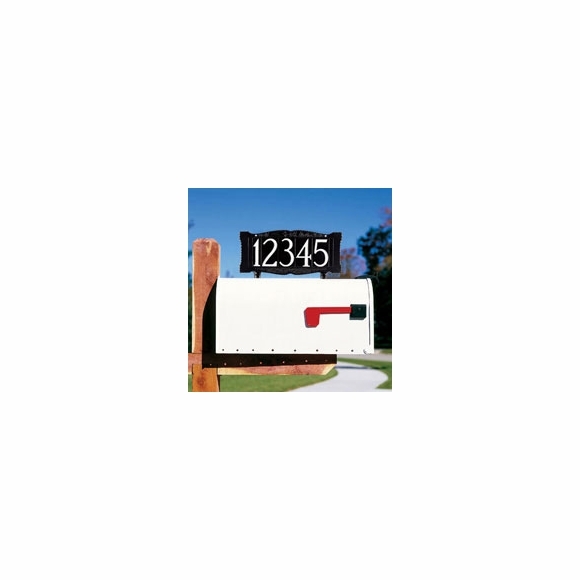 Whitehall Mailbox Topper 4" Number Address Sign - - one line house number sign holds up to five large 4" numbers. Made in USA. Two sided address sign can be seen from both sides of the road. Same numbers displayed on front and back. Personalized mailbox topper house number sign with large 4" numbers. Made in USA. The mailbox topper is an excellent product! I bought it to add to an existing mailbox so had a little extra work to do drilling holes into my current mailbox, but the install was easy and came with everything needed. It looks great and the numbers can easily be seen which is needed since my driveway is a bit hidden. Exactly what I wanted. Large and easily visible. Easy to mount onto existing metal mailbox. Love the reflective numbers. Would like to have option of reflective numbers on different colored backgrounds, but the reflective option outweighed the desire for a colored sign. Nice looking and good quality. I wish the pictures had more details so that you can see how it will really look. Overall is very good. The metal sign has numbers on both sides -- this was not clear in the on-line description. . The sign came with two small cork washers. I replaced these washers with slightly larger and thicker rubber washers. Installation was very easy and took less than 30 minutes. Very satisfied with the outcome.